Capacity - Up to 600 lbs. TS4 top plates have fixing holes to suite 3/8" diameter bolts. Capacity - Up to 3,300 lbs. The REVVO H Series top plate range of kingpinless fabricated steel casters makes them strong and extremely robust. Designed for towing speeds of up to 10 mph. Capacity - Up to 4,400 lbs. The REVVO P Series top plate range of kingpinless casters incorporates two large diameter case-hardened ball races. In addition, the side plates are press formed for extra durability. Designed for towing speeds of up to 10 mph. Capacity - Up to 11,175 lbs. The REVVO T Series range is one of the most ruggedly constructed kingpinless casters that Revvo manufacturers. These casters are designed for use in adverse working conditions, heavy loading, poor floor surfaces, and shock loading. 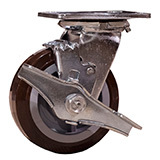 Revvo low level casters are designed for special applications where a caster is required for moving heavy equipment over level surfaces. 2SL top plates have fixing holes to suit 1/4" diameter countersink head screws. Revvo low level casters are designed for special applications where a caster is required for moving heavy equipment over level surfaces. The Revvo EU Series casters are designed for light applications where casters are subject to manual propulsion. They are available with rectangular top plates as well as a bolt hole, swivel-only version. The bolt hole version is specifically designed to fit a range of expanding plugs and threaded stems. The Revvo AH caster is a high-quality caster designed for business machines or other specialized uses. It features a low-profile 2-inch twin polyurethane wheel on a cast iron center.